It might seem a sensationalist claim, but with the advent of virtual reality we could be on the brink of the biggest change to the way we watch films in over a century. There have been other landmarks on the silver screen: the introduction of Technicolor in 1917, green screen digital composing in the 1940s and CGI in the '70s; cinema has always been a forum for massive innovation, adding in more realism and immersion to justify the ever-increasing price of entry. 3D cinema was supposed to be the next big thing, but lost momentum due to a vaguely interesting tangent. However, filmmakers are getting very excited about virtual reality (VR) for good reason. The notion of filming in 360 degrees offers the chance to step into a movie and feel completely immersed, bringing new interest, challenges and possibilities to the movie world. But like VR gaming, which is only just beginning to take off commercially, people's expectations of 360 film are varied. While there's a good chance it will revolutionise the movie industry - transforming traditional cinema and replacing 3D goggles with VR headsets - we are only just touching the surface, and even those excited by the possibility, both behind and in front of the camera, aren't honestly sure exactly how it will take shape. Despite question marks over how the medium will evolve cinematically, there's no doubting VR movie-making is already a 'thing'. Youtube has a whole channel dedicated to 360-degree videos, giving a perfect platform to create reams of content for the new medium. But since VR movie making is such a new platform for storytelling, it's an unregulated melting pot, made up of films of varying quality. While the growing popularity in VR headsets shows audiences are intrigued, those making 360-degree movies are having a hard time giving them what they want, mainly because there's no standard way of creating Hollywood-quality 360 movies yet. As a result, there's an endless list of hurdles to overcome in every aspect of the VR movie-making process, from filming to post-production. The future of cinematic storytelling? Many VR film creators come from large companies that have set up a VR 'division', but there are also a few VR-only firms that have recognised the potential in developing only this type of content. Simon Robinson, chief scientist and co-founder at software developer firm The Foundry – a large company that delivers high-end visual effects and 3D content for the design, visualisation and entertainment industries – said the reason there's so much 360 content around this early is because it's easier to experiment with. "We have a bunch of customers who take a rig of GoPro cameras out to experiment with and that's why there's an explosion of that kind of content on YouTube 360. [It's] the same with Facebook 360," Robinson explains. "The deceptive thing is it's easy to get started. I could nip down to [an electronics store] now and buy myself a bunch of GoPro cameras with a big fat cheque book, and go off and do something. Getting any kind of content [this way] is relatively easy, but...good-looking content is extraordinarily hard." So the appetite is there to make good-looking, slick VR movies, but it's proving difficult to integrate a ball of cameras into an industry that's set up for flat filming. One of the biggest challenges is working in stereoscopic film, a motion picture camera system that presents two offset images separately to the left and right eye of the viewer. The equipment is there - but is the ability? When used in 360 film, the VR headset will present these images in a way that allows the user's brain to combine them and give the perception of 3D depth. While there are plenty of benefits for the viewer, such as added realism, it is added work for the creators as they have an extra perspective to think about. There's also the added labor of working in a spherical environment rather than a flat one. "[Artists] can no longer pan from the left and right to the end of an image because there is no end of the image, they are having to think about sitting in a bubble instead," adds Robinson. "The expense of producing this stuff is also a great challenge. The cost of doing it well is extraordinary." While the technology and tools involved in post-production is proving difficult to develop in bringing content to life, there are also a lot of on-set challenges. By having a ball of cameras on set, the directors and crew who would usually be the engine behind the action have to disappear, or else they'll be visible in the content. However, Will McMaster, head of VR at Visualise - a company that deals in high-production value VR and 360 film content - argues that the technology available to the industry currently isn't what's truly challenging in the race to producing exceptional 360 movie content. "A lot of people talk of the difficulties in hiding the crew and equipment, but it's not really a challenge," McMaster says. "We can [digitally remove] certain elements pretty easily and it's definitely a big consideration when you're shooting because you can't have a whole regular crew there, but it's not the most challenging element in filming." 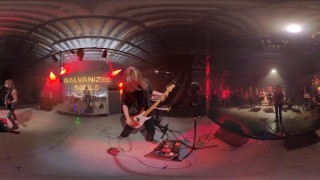 For Visualise, the most taxing element is setting up a 360 scene and directing it so that it works well for VR filming. This requires a very different way of thinking to regular editing and directing, McMaster says, because you have to be aware of additional aspects, such as where everything is spatially and how the viewer's attention is moving. For example, when creating Fashionably Bound - a virtual reality series made in partnership for Samsung and fashion website Refinery29 documenting nightlife locations in iconic landmarks - McMaster says the biggest challenges were in directing a number of factors simultaneously. Where would the presenters stand? Which camera they would look at while presenting? What else would be in the scene at the same time if viewers decided to look around and shift their attention away from the main speakers? This issue is particularly evident on the post-production end of the spectrum, notes Robinson. While the benefits of 360-degree filming are obvious - a more immersive movie experience will lead to a more compelling story - there's an endless list of problems to solve, largely because the medium is still so new. One of the biggest problems is in stitching, the editing process needed to merge all the footage together from a 360-degree camera rig: a ball of cameras all facing outwards. Not only do these rigs gather 10 times more data than traditional methods, but it's also difficult ensuring the edges between one camera's frame and another fit together neatly in the post-production stage. "People like the idea that when you put your headset on you feel as immersed as possible," says Robinson. "And any flaws in the material break that sense of immersion. If you turn your head around and see a vertical line between where one camera ended and the next begins, it's disconcerting enough that you start to feel detached from what's been filmed." For the VR and 360 film industry generally, a great deal of 360 video content out there right now isn't very good, chiefly because - going back to what Robinson said - low production value content is much easier to create and post-production costs are expensive. But as McMaster notes, the real dilemma to make VR something that doesn't go the way of 3D filming isn't cost, it's the simple fact that its producers and camera operators just don't know how to harness it yet. "VR and 360 film content is not something you can just pour money into and it will magically be good," he says. "It's going to take many years, maybe even decades, for content producers in VR to figure out the mechanics of how a story is told this way." For McMaster, people need to lower their expectations a little when it comes to VR film because it's going to take a long time to figure out. He makes the point that in the early days of cinema, "we didn't just start with Citizen Kane". It's easier to demonstrate the power with VR in an interactive or gaming experience on the HTC Vive for instance, but 360 video is a completely different ball game and could signal the end to traditional cinema as we know it once (or if) it truly takes off. "We will get there, but it's not going to happen this year, or next year," McMaster says. "If you compare VR to cinema it's like 1906 right now; if you think about the narrative complexity of Charlie Chaplin compared to more modern films, there's no real comparison. And it's not entirely because cameras and the technology in filming got better, I think that's because the mediums and ideas take time to develop." But how will we be viewing this content? According to McMaster, it's too early to say which headsets will be the most dominant for viewers; whether Samsung's Gear VR, a larger headset from something like HTC or Oculus or even Google Daydream will lead the market it remains to be seen. We do know that as the technology advances in developing the medium of 360 film, the headsets we view it on will become ubiquitous, like how the Android operating system features on different phone manufacturers. "There'll be two or three dominant content platforms and every piece of VR hardware will work with these platforms," he says. But the rise in 360 VR films and a potential success that could see it taking over cinema is not a question of hardware. It's more about artistic development, and those involved in its production figuring out the best way to give audiences an experience that is more than just seeing a flat film in 360 degrees. And this stuff takes a long time. There's a big gap that needs to be filled in developing convincing and truly immersing VR films and it's going to take industry leaders many years to figure this out - so while this isn't going to race onto the scene like 3D, that could be the very thing that makes watching films in VR such a success.